The last few weeks I've been struggling to find the right pair of shoes for this weather. There was rain, then snow, then ice, then snow, then rain again. I decided I may need a new pair of wellies. 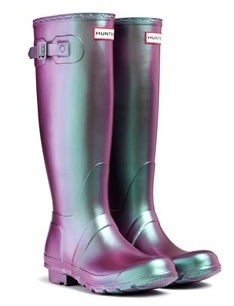 I was having a browse over at Hunter's website and found this lovely pearlescent pair (£89.00). Sadly, they are not meant to be for me - the calves are too small for my foot size. Le sigh. All is not lost tho, I do have a pair of wellies I can wear. Okay, I did cut them so that they fit my calves, but still... it's not ideal. I can't be the only lady with UK size 5 (US size 7) feet and 42 cm calves. Honestly, I don't look like some weird out-of-proportion monster, but when it comes to boot shopping, I might as well be! How about you? What do you wear in this wet winter weather?